Melamine Cyanurate is a halogen-free flame retardant that can be used in thermoplastic urethanes (TPUs) for electrical wire coatings. 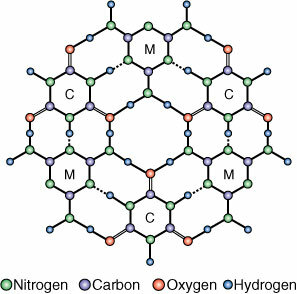 held together by an extensive two-dimensional network of hydrogen bonds between Melamine and Cyanuric acid, which network forms layers such as graphite. Note: These are typical properties of Melamine Cyanurate (C3H6N6 – C3H3N3O3).